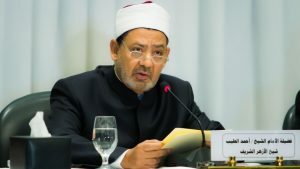 Egypt’s Al-Azhar observatory has mocked the Islamic State group (IS)’s video showing the bomber of the December attack against a Coptic Orthodox Church in capital Cairo, saying that the group is trying to lure new recruits as it is on the verge of disappearing due to a series of defeats. ISIS Sunday posted a 20-minute video promoting the last statements of Mahmoud Shafik Mohammed Mostafa, the suicide bomber who blew himself in the church. The Sunni Muslim world’s highest theological institution has indicated that the footage and the statements were taken out of context to promote sectarian strife between Muslims and Christians in Egypt. “The video used statements taken out of context as alleged proof of Christians’ hatred towards Muslims, and employed misinterpreted Islamic scripts to promote their evil agenda,” the institution said on its website. “It was clearly obvious that ISIS’ video aims at exaggerating the group’s actual might, especially after the heavy losses it recently suffered by losing most of its controlled territories in Mosul in Iraq, Al-Raqqa and Deir Zour in Syria and Sirte in Libya. “ISIS is trying to send a misleading message that the group is still capable of carrying out terrorist attacks in order to deceive and recruit some of the Muslim youth,” the istitution added. Twenty-four people were reported dead by authorities in the December attack. Egypt has been facing militancy from IS fighters in restive Sinai Peninsula since 2013. The Islamists have vowed to avenge the toppling of Islamist President Mohamed Morsi in 2013. Though attacks have largely taken place in the Sinai Peninsula, they have also spilled into the capital and other cities of the North African country. Written by: Jaber Ali on February 23, 2017. Posted by Jaber Ali on Feb 23 2017. Filed under Headlines, World News. You can follow any responses to this entry through the RSS 2.0. Both comments and pings are currently closed.